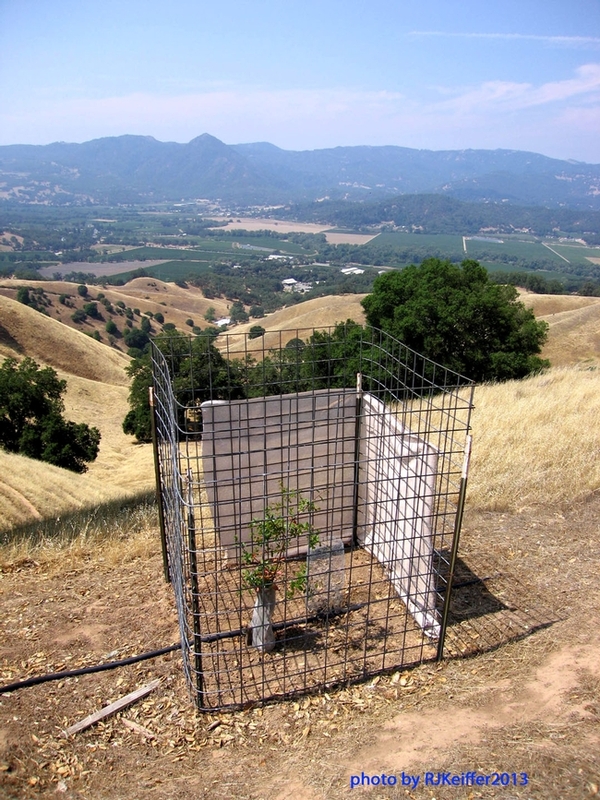 Most of the landscape on the UC Hopland Research & Extension Center located in southeast Mendocino County is steep terrain with a hot, dry, southwestern exposure. This combination makes for tough conditions for tree regeneration and establishment, whether natural or manipulated. In addition to the above, there are a couple watersheds on the Center that were almost completely cleared of woody vegetation by a past methods of herbicide application and prescription burning. Here you see an attempt to establish an interior live oak seedling under such conditions. Seedling establishment starts with deep-potted seedlings (18" deep), weekly drip irrigation through the hot summer months (for two or three years) , initial screen protection from grasshoppers, enclosure fencing to protect from herbivory by rabbits, deer, and sheep, and shade cloth to protect from the hot afternoon summer sun.